ARES enlarged the factory for the second time and moved to Dali, Taichung with 6000 square meters factory area and developed three major machine models. ARES was certified in ISO9002:1994 quality system. ARES successfully developed economic short travel machines which become the main force machine. ARES achieved the annual goal of successful marketing in five continents. ARES was qualified for international quality standards such as CE and EMC and had its first factory enlargement in order to increase production performance. The products have been successfully exported to the US and European countries. ARES MACHINERY CO., LTD. Was established in Taichung Taiwan and is the only professional factory that develops and produces high-speed high precision drilling & tapping machining centers. ARES was certified in new CE, EMC and ISO9001:2008 quality system by TUV. ARES developed and marketed server ATC of R series. ARES continues to develop and completed six machine types; the use of PDM and ERP systems. ARES developed and marketed direct drive small size machine tools. ARES achieved the annual goal of 50% of growth. ARES enlarged the European market and completed the marketing layout in Germany; continue to develop and completed three types of machines. 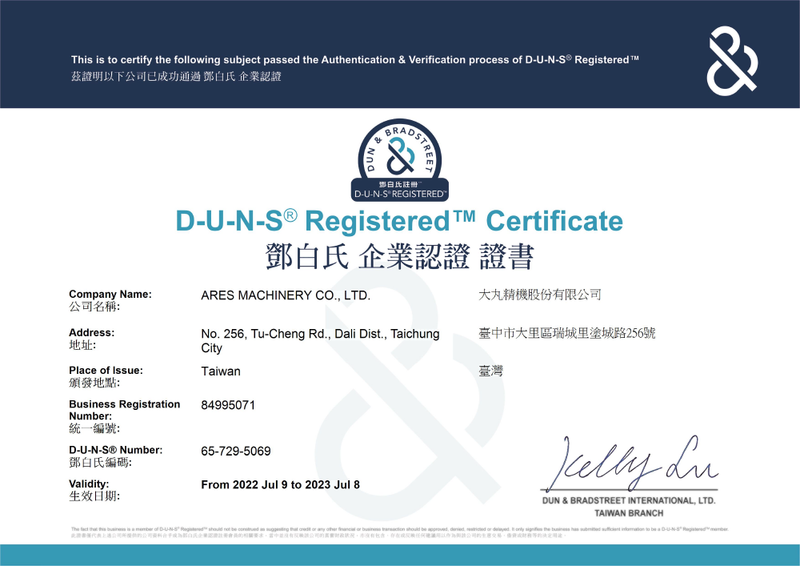 ARES was certified in ISO9001:2000 quality system by TUV. ARES developed large multi-function traveling column machine tool. ARES successfully developed Horizontal pallet change type -- H4040P continuously. ARES successfully developed R12030 and established the second factory. ARES successfully developed R12040, A12030, A12040 continuously.